The southern Burgundy region of France is a treasure of historic churches and chateaux set in rolling countryside, carpeted with vines and forests. 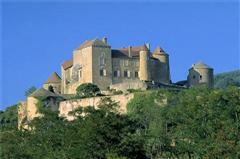 Below you'll find customers comments following our walking holidays in Burgundy, France. "Enjoyed experiencing the warmth and hospitality of the people after a delightful day walking in the countryside. Thank you again William for another memorable family holiday." N & A Blackhall, UK. "Whilst all the hosts were welcoming, those at Pierreclos were exceptional. The food at Ige was exceptional and at Fuisse, the room and character of the building was excellent." B&V Marlow, UK. "Enjoyed everyday. Guest houses are all superb. Great food. All well planned walking routes and stops, look forward to our next holiday with High Point." G.Davies, UK. "Ige (was my favourite guest house), the house was very quirky and interesting, the hosts were very friendly and the food was superb." J Peacock, UK. "I think this holiday has far exceeded our expectations and hope we will return to experience another region of France. Good to be out of the main tourist areas." E Hodgson, UK. "I was impressed from the first moment I walked into my room at Aux Terrasses and got my personal walking notes (with my name on them.) Honestly, you couldn't make this holiday any better. Everything worked smoothly, the guest houses were wonderful, the hosts very welcoming, the paths lead exactly where I was told they were going and routes well thought through with plenty to see along the way. Will definitely book again!" I. Davies, UK. "The holiday was great because of the excellent itinerary through fabulous countryside and the chambre d'hotes gave us real contact with French people. The opportunity to practice speaking French was an unexpected bonus of the holiday" Mr D Burrows, UK.